Designed by Judi Boisson. "Bunny-Baby" Bumper Pink Cotton Handmade -Appliqued and Embroidered Reversible Cotton. Designed by Judi Boisson. 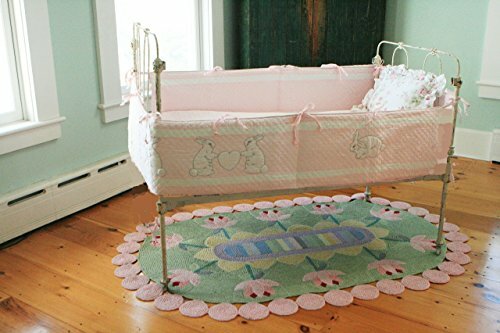 "Bunny Baby" Bumper, in Pink. Handmade with White Bunnies Holding a White Heart on a Pink Background. Available in 3 Color Combination- Pink, Yellow, Blue. Hand Appliqued, and Embroidered and Quilted. 100% cotton. Reversible. Loved by All. Cold Water Wash- Before Washing Bumper, please remove insert. View More In Crib Bedding. If you have any questions about this product by JUDI BOISSON, contact us by completing and submitting the form below. If you are looking for a specif part number, please include it with your message. Designed by Judi Boisson. "A" You're Adorable" "B" You're so Beautiful ! Colorful Letters on a White Background. Reversible. Cotton. Designed by Judi Boisson." Katy and her Neighbors"-Home, Where Little Girls want to Live-Garden Where Little Girls want to Play, Neighbors,Where Little girls like to Share. Washable.